Backed by the Strongest Warranties. Your Legacy Edition Pool is built for life, a statement we back with a limited LIFETIME WARRANTY with a one-time transferable provision. Our steel stair systems are protevted with a Limited Lifetime Non-Prorated Warranty. We offer an exclusive 5 & 20 Warranty on our interior pool finishes, with 20 years of prorated coverage, and the first five years covered in full. Its super structural strength is required to build bridges and erect towering buildings. The structure of an inground swimming pool demands solid support, too. That’s why all Imperial Legacy Edition pools feature sturdy steel frame construction. The inherent qualities of steel withstand extreme external pressures and are capable of containing tons of water without buckling under the stress or strain. Imperial’s 50 years of experience developing and refining steel applications have made us a leader in the industry. The superior strength and quality of our workmanship upholds our commitment to excellence. As proof of our commitment to design and fabrication excellence, every Imperial Legacy Edition pool comes with a limited LIFETIME WARRANTY with a one-time transferable provision. The steel walls of your Imperial Legacy Edition pool are guaranteed for life against any defect in material. This assures you protection against damage due to rust, corrosion, or material defects. Imperial Pools, Inc. warrants the Steel Wall Panels for the Lifetime of the original retail purchaser. We agree to replace or repair, without charge to you, at our factory, any panel which rusts or corrodes beyond use during this period. If the Legacy Edition Pool panels should rust or corrode beyond use during this period, you should send a letter to our factory identifying the panel. We will repair or replace the defective panel or panels after either (1) receipt of the defective panel or panels at our factory for factory confirmation of the defect or (2) at our option confirmation of the defect by an authorized representative at the pool site. Repair or replacement will be completed within 10 business days. This warranty is enforceable only by the original retail purchaser of the Legacy Edition Pool or by a qualified transferee of the original retail purchaser. A qualified transferee shall be the next owner of the real property upon which the Legacy Edition Pool was originally installed who has forwarded to Imperial Pools at the address stated below, a copy of the deed or other instrument of transfer of title indicating the change in ownership within 30 days following the transfer of title. Upon any subsequent sale of the real property where the Legacy Edition Pool was originally installed, this warranty shall terminate immediately. Units or assemblies such as filters, pumps, motors, skimmers, standard fittings, heaters or accessories purchased by us for use in the pool are subject to and carry the original manufacturer’s warranty only. Our factory is located at 33 Wade Road, Latham, N.Y. 12110 and is open for business Monday through Friday, 8:00 a.m. to 5:00 p.m.
Freight charges for any panels returned to us for replacement or repair must be prepaid by you. Freight charges for the return of panels repaired or replacements must also be paid by you. Any panel, replaced or repaired by us and returned to you shall be installed or reinstalled by you at your own cost. In order for you to obtain maximum use and enjoyment from your Legacy Edition Swimming Pool, you should keep your pool full of water at all times. We are not responsible for any irregularities or imperfections which may result from the removal of water from your Legacy Edition vinyl liner pool. Our total liability to you under this warranty is limited to carrying out the terms of our warranty. Unless Imperial Pools, Inc., installs your Legacy Edition Pool, we have no liability to you for faulty installation of your pool or for damage to panels, which may result from faulty installation. We shall not be responsible for any damage or defect to panels, which results from your acts, or the acts of others, and we shall have no liability to replace or repair any panels so damaged. agreement executed in connection with the purchase or installation of the Legacy Edition Pool. This warranty gives you specific legal rights, and you may also have other rights which may vary from state to state. You also have implied warranty rights. In the event of a problem with warranty service or performance, you may be able to go to a small claims court, a state court, or a federal court. This warranty is in compliance with the Consumer Products Warranty and Federal Trade Commission Improvement Act. The warranty begins on the date of installation. This product is warranted by Vinyl Works, Inc. to the original purchaser only against failure resulting from defective material and workmanship in welding seams and edges for Fifteen (15) years, with the replacement cost to be prorated after the first (1st) year. This warranty applies only to liners purchased for private residential use. This warranty does not cover damage caused by shipping, mishandling, faulty installation, improper acts of others, or acts of God. This warranty specifically excludes holes, cuts, tears along seams, bleaching, and wrinkles, which develops over time. These conditions are caused by misuse, improper installation, improper addition of chemicals, or poor maintenance of pool water chemical balance. Your liner must be installed according to the directions and properly maintained. This warranty does not cover the abrasion of pool liner print caused by automatic pool cleaners. This warranty does not cover ice damage. This warranty does not cover normal fading of color, or microbiological staining. All colored vinyl products, subjected to direct rays of the sun, may fade in time. Such fading, or microbiological staining, does not qualify as a material defect. Staining or fading does not affect the ability of the vinyl to perform its intended function. This warranty does not cover irregularities, imperfections, or damage, which may result from the removal of water from the liner. You should keep the pool full of water at all times. This warranty is null and void if alterations are made to the pool design or if accessories that can cause damage to the liner used. We will replace, according to the pro rata schedule, any liner found to be defective. Charges for shipping, removal, installation, and service calls are not covered by this warranty. Replacement will be completed within 10 business days of confirmation of the defect and receipt of your payment, if required. If your liner should fail during this period as a result of a problem covered by this warranty, you should send a letter to our factory identifying the liner and date of installation, along with proof of purchase. Determination of the claimed defect may be made upon receipt of the liner at our factory. At our option, confirmation may be made by an authorized representative at the pool site. All warranty claims must be made directly with Vinyl Works, Inc., and no merchandise is to be returned to us without prior written authorization. Vinyl Works, Inc. shall not be liable under any circumstances for any incidental or consequential damages or expense of any kind. This warranty shall be unenforceable if you are in default under the terms of any agreement executed in connection with the purchase or installation of this liner. This warranty is intended to be in lieu of any and all warranties expressed or implied. It is a complete statement of our obligation. No agent or dealer or other individual is authorized to change this warranty and any such change will not be recognized by Vinyl Works, Inc. This warranty gives you specific legal rights. You also have implied warranty rights, and may have other rights which vary from state to state. In the event of a problem with warranty service or performance, you may be able to go to small claims court, state court, or federal court. This warranty is in compliance with the Consumer Product Warranty and Federal Trade Commission Improvement Act. Alluring designs and patterns. Quality craftsmanship and durability. Trustworthy liners that endure. Using only the finest virgin vinyl materials, handcrafted quality workmanship and computer drafting precision, the Legacy Liner Collection creates exceptional beauty that stands the test of time. This product is warranted by Vinyl Works, Inc. to the original purchaser only against failure resulting from defective material and workmanship in welding seams and edges for Twenty (20) years, with the replacement cost to be prorated after the fith (5th) year. Talk to your Certified Legacy Builder for registration details. Notice: This brochure is for illustrative purposes only. Imperial Pools makes only those representations which are stated in its written warranties. Any other representations, statements or contacts made by the Certified Legacy Builder and/or the contractor regarding any materials produced by the fabricator are attributable only to the Certified Legacy Builder and/or the contractor. The Certified Legacy Builder or contractor who sells or installs your pool is not an agent or employee of Imperial Pools, Inc. Imperial Pools are intended for private residential use only. 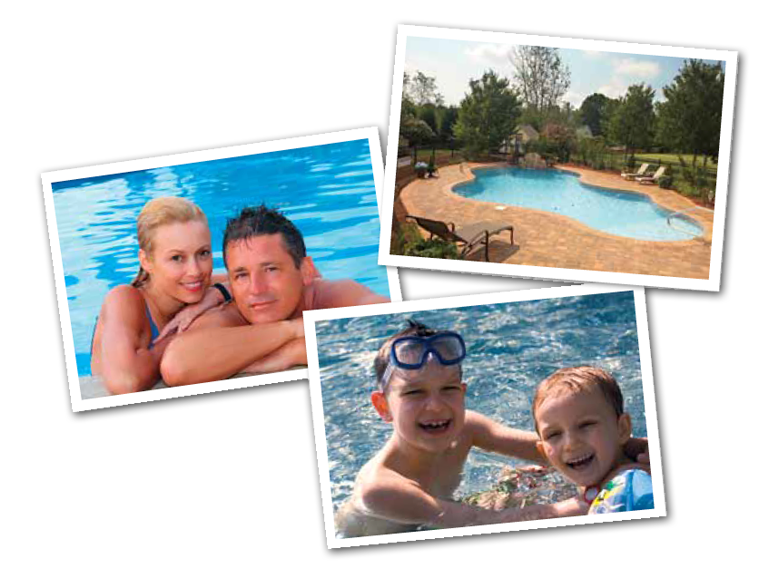 All pool sizes depicted in this brochure are approximate. Ask your Certified Legacy Builder for blueprints. Caution: The use of diving or sliding equipment can be hazardous. Imperial Pools, Inc. does not recommend the use of these appliances. If used, care should be exercised to use only equipment meeting the recommended safety codes established by the Association of Pool & Spa Professionals.